The first industrial building in New Zealand was a printer and bookbindery, built as part of the Roman Catholic Mission Station in Russel, to produce Bibles and other religious texts in Maori. It has been restored to working condition, even including a tannery to make leather for the covers. These are reproductions of one of the first texts printed, Ko te Ako me te Karakia o Te Hahi Katorika Romana - The Teachings and Prayers of the Roman Catholic Church. Unfortunately we were there too late for the guided tours, and there was very little in the way of explanation of the various exhibits. 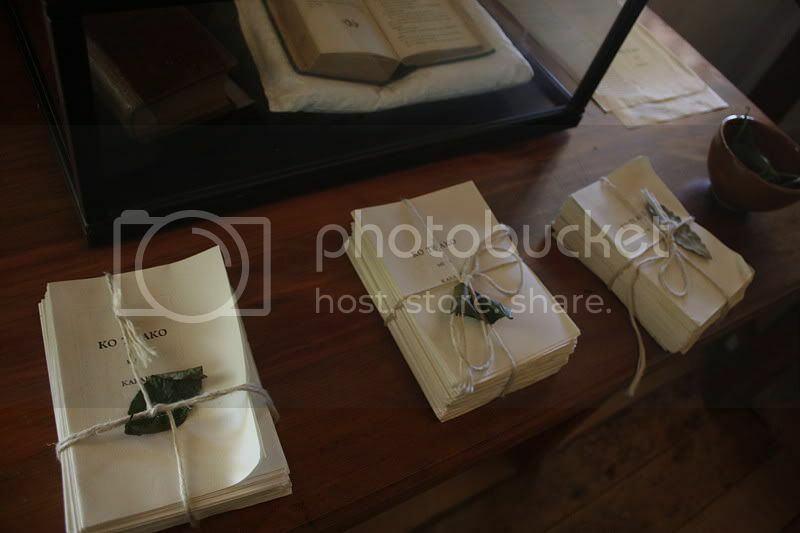 In the picture above there is a leaf - it appeared to be some kind of citrus leaf - tucked under the string holding the pages together in each of these half finished books. The same type of leaf was also pressed in the books being stitched in the press, for all the world like a bookmark. Since all knowledge is contained in LiveJournal (and the rest is contained in Dreamwidth) - do any of you wise people know what the purpose of those leaves is? This is a wild guess, but could it be to repel insects like silverfish? My mum had a similar idea. I suppose it's possible. Have you found an answer to this yet? Could you call them when someone is there who may know? No! I have no answer yet. I could try doing that, yes. Yep, it's to repel insects.